The much awaited ultrasound took place today. Phill and I were introduced to our soon to be son or daughter, who is currently 6 weeks and 6 days. That's right - one healthy little baby. 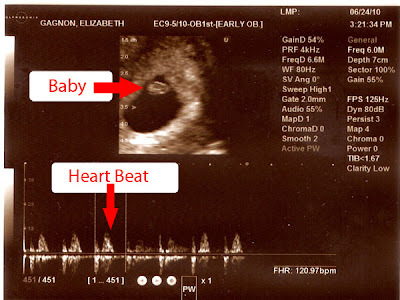 Dr Trolice was able to show us a strong little heartbeat (117 beats a minute) and also was able to give us great reassurance that everything was growing just as it should be. We will go back again in 12 days for another ultrasound. During this appointment we are hoping to see an increase in the heart rate and appropriate growth. Also, which I think is neat, we will be able to see the little arms and legs moving about. We will keep you posted with updates over the next few days as we wait for the next appointment. For now, we have just been sitting in our living room with huge smiles - the kind from ear to ear. Well, well, I get what I wish for. Man, oh man, I am not feeling well. During week 4 and week 5, I know a few of you were asking me how I was feeling and my response was always "I wish I was feeling something. I just feel so normal". I think I even started to worry that maybe I wasn’t really pregnant. Well, about an hour after getting the results from my bloodwork work on Thursday, I noticed a major change. I noticed that all the sweet smells around me started making my stomach turn sour. Hearing people talk about what they were going to have for lunch would make my mouth water and my tongue feel fat. Needless to say, I have been having some of the mean & ugly nausea ever since. I wake up... feel sick. Get to work… feel sick. Leave work... feel sick. Go to bed... feel sick. The rocket scientist that decided to term this feeling as ‘morning sickness’ must have miscalculated a few hours from the duration of time that a woman feels sick during the day. That is my update for today. I am happy that I feel pregnant but a little sad that I can’t eat. The picture above explains a little of how I am feeling... I feel green. As most of you know, I have not been having may pregnancy symptoms since we found out that we were pregnant. This was really starting to concern me because I was just having a hard time coming to terms with the fact that my body just enjoys being pregnant. So, yesterday, I called my doctors office and asked that they put a worried mind to rest by taking my blood. They got me into the office bright and early this morning to take my blood. We were hoping for 10,000 HCG (pregnancy hormone level). I just received a call from the nurse with an update regarding my levels.... I was at 32,000. Her words were "you are very pregnant". So, my update for today is this, I am very pregnant! We will get our scan next week and I am sure that we will post updates as soon as we are done. During this meeting, we will look for a heartbeat (or heartbeats). I look forward to posting again really soon. The update I have this evening is about 'baby'. I thought that it would be interesting to share a few details about what has happened over the 5th week. The baby's jaw, cheeks, chin, eyes, ears, and nose are beginning to form what will eventually become one adorable face. In addition, the kidneys, liver, and lungs are developing, and the heart is now beating 80 times a minute (and getting faster every day). All this and it's still no bigger than the length of a nail head (about a quarter of an inch) from crown to rump! I promise to post again soon... but that is what I have for tonight. Well, its official....again. Beth is still pregnant. Today marks the start of week 5. We have our first ultrasound scheduled for 2 weeks from today, so be sure to check back for the update from that. Also, each Thursday until the baby is born, we will be posting "baby bump" pictures, so be sure to keep and eye out for those. If you are looking here, then you probably already know the good news.... Beth is pregnant! We will be updating this site with all sorts of goodies to keep everyone up-to-date, so be sure to check back often!